Daughters of a musical instrument maker, Rowan and Anna Rheingans released their debut album, ‘Glad Gold Hearts’, in 2013, but it wasn’t until 2015’s ‘Already Home’ that they arguably hit their stride – winning Best Original Track at 2016’s BBC Radio 2 Folk Awards for ‘Already Home’s Mackerel’. Despite ‘Already Home’s’ success, new album ‘Bright Field’ marks a real step change for the duo, whose sound calls on not only music from the British Isles, but also outside these shores (both have studied in Sweden and Norway, while Anna plays and teaches in Toulouse, France). It’s also their first to feature almost exclusively original material (there’s only one ‘traditional’ credit). Key to the creation of the record, and their development as songwriters, has been their decision to spend more time on the process. ‘We spent about a year writing and working towards the album, and then we recorded it quite slowly,’ says Rowan. ‘In the past we’ve had four-and-a-half-days and tried to record three or four songs a day. With this one, we wanted to go into the studio on the first day and only think one song ahead. We do that song, then we move on. We decided on a slower pace, to think about the detail. I’m proud of how much space there is in the album, we’ve taken time to enjoy it. For the first two, we were desperately trying to find a week to record. Now, we have more of a reputation, we can rest a little bit, and take our time a bit more. Central to the album is the title track, which is based on a poem by writer R. S. Thomas, who spent much of his life as a clergyman in rural Wales, and passed away in 2000 aged 87. A fan, Rowan picked up several books of his prose from a local Post Office while visiting a friend who was studying on the Llŷn Peninsula, where Thomas used to live. But it was a chance discussion about Thomas with a former headmaster after a gig that led Rowan to re-evaluate ‘Bright Field’. RS: ‘He said his favourite poem was ‘Bright Field’ so I went home and re-read it. That was two-and-a-half-years before we finally realised we could frame this whole album with it,’ she recalls. Bright Field’s songs are framed by two almost other-worldly instrumentals, Anna’s ‘Glattugla’ and Rowan’s ‘Three Springs’. Though they did debate the placing of the two instrumentals, in the end, the sisters decided to trust their instincts and the listeners. 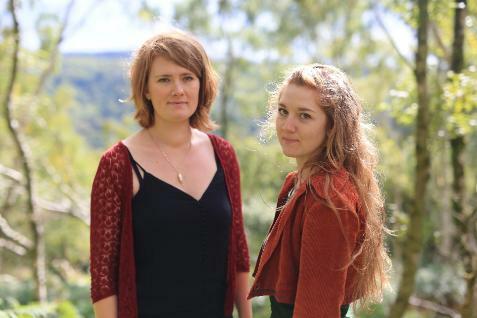 The coming months see the sisters perform headline dates across the UK and take to the stage at several major festivals, including Towersey in Oxfordshire (24–27 August 2018), where Rowan will be appearing both with Anna, and also her other band, the equally acclaimed folk trio Lady Maisery.